Copper Phosphorus Brazing Alloys are known for their various unique features. We manufacture these Copper Phosphorus Brazing Alloys as per the approved standards of quality of markets. We have gained kudos on the base of the quality and attractiveness of these Copper Phosphorus Brazing Alloys. The accurate composition, melting range, of copper phosphorus brazing alloy is the trusted feature of the keep growing demand of these Copper Phosphorus Brazing Alloys. 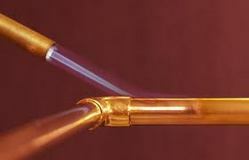 Copper Phosphorus Brazing alloy is particularly adaptable when close fit cannot be held. We do not make any compromise in terms of quality and so we test these Copper Phosphorus Brazing Alloys on different quality parameters that assure our clients with durability and accuracy. Lohia Traders is associated in providing Welding Equipment, Safety Equipment and Gas Welding Equipment that are fabricated with high quality raw material. Our range of products find extensive application in various industries. These equipments are preferred by our clients due to their unique features including reliability, durability, easy operation, reasonable price, dimensional accuracy, high end finishing, etc. We provide our customers best quality and high performance equipment that require low maintenance and can be easily operated. Further, we also provide our customers with customization facilities as per their requirements. Our team plays an important role in providing high quality products to our clients. We are Providing every Solution to the needs for Welding, Safety & Tools. Our Clients are from the Field of engineering, Construction,Automobiles, Air conditioning, cutting tools, Solar Power, Heating Elements, Jewellery, pneumatic, Transformer, Switch Gear, pipeline Works, Hydraulics.